Portland City Council heard public testimony Thursday on a proposal to dramatically increase the regulation of the screening process, security deposits and other aspects of renting. Supporters say it’s a necessary step to combat discrimination in the rental market and for Portland to live up to its progressive values. Detractors say it’s overly prescriptive, heavy on red tape and could have unintended consequences — like raising rents. 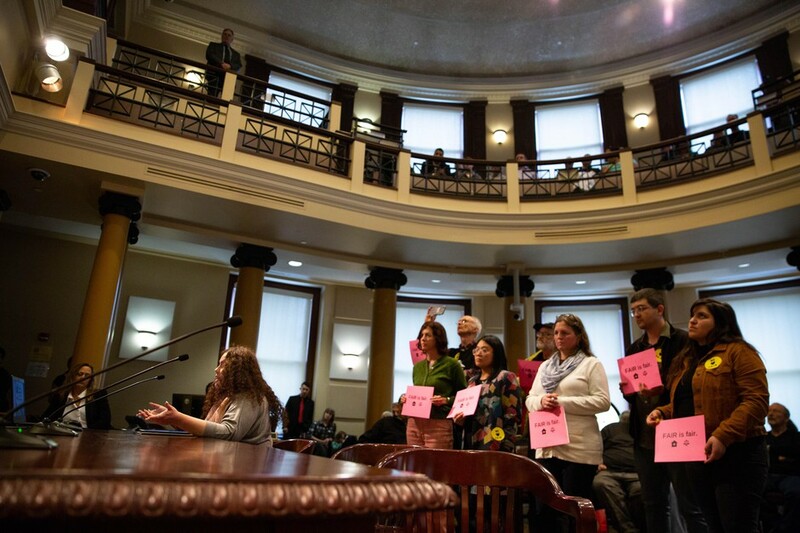 Members of the community give testimony to the Portland City Council on April 4, 2019. More than 50 people came to council to testify. They were split broadly between tenants, community organizers, and affordable housing advocates who largely favored the ordinance, and landlords and developers opposed to it, though two landlords broke ranks and backed the proposal. Key concerns: Regulation stifling investment, cost of compliance, the ordinance’s cap on the income ratio landlords can require as two times the rent. Testimony highlights: “First, HUD, Fanny Mae and Freddie Mac all require that we screen at three times the rent, in order to be in compliance with their financing. To mandate a criteria that is lower than that will put landlords in default on their mortgages. In order to attract institutional equity to be able to build new projects in Portland and thereby provide additional housing, we are required to screen three times the income in order to access institutional equity. “In order to look at the compliance aspects of the very confusing pages here, our estimate is it will take one person per hundred units to be able to deal with the challenges. That will raise rents on Portlanders approximately $65 per unit, per month. Key concerns: Renters need protections to prevent their financial exploitation, but the bill could be simpler. Renters shouldn’t be penalized for credit card debt because it’s often a survival strategy for people dealing with high costs of housing. 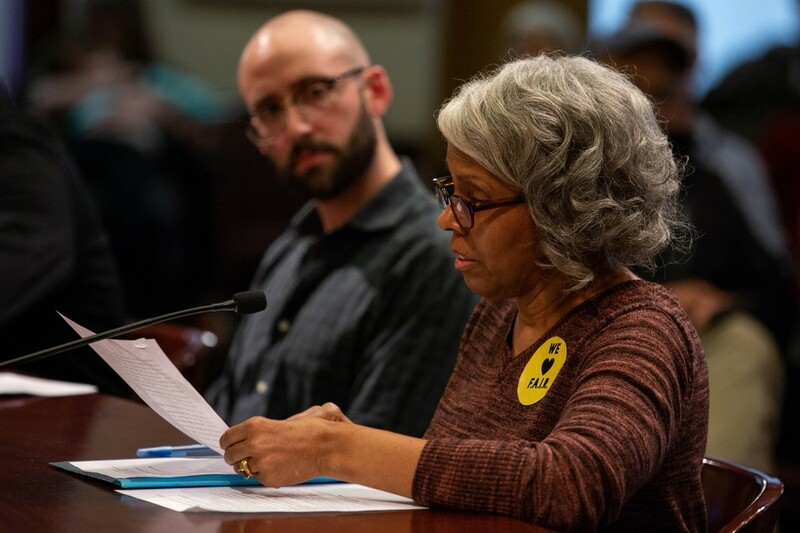 Portland resident Marih Alyn-Claire reads testimony during a Portland City Council hearing on April 4, 2019. Alyn-Claire is part of Tenants Priced Out, an advocacy group for tenants facing displacement. Testimony highlights: “I support many of its basic elements, allowing different forms of identification, lowering the income rent ratio to two times the rent, security deposit caps, the anti-discrimination look-back periods for criminal histories which really impacts people of color. “One significant issue for me, however, about the proposal is step two, which is focused mainly on debt and credit history, as primary first measurements for assessing a tenant’s worthiness for access to housing. “I wondered why rental history as the main measurement was not foremost, not credit and debt load. … It’s astounding to me how this essential category didn’t make the list. For long-term renters like myself with 10, 20, 30 plus years of solid rent payment history, this is our credit rating. “For years, renters have endured the abusive practices of rent gouging, burdened with paying 50–80% of their income on rent. Then, having to run up balances on credit cards to pay for groceries, medicines, daycare, multiple moves after being rent evicted several times. “And still, we’re having to qualify over and over again, risking disqualification over debt as a means of survival, before the very industry that has profited from our misery. “For renters, these type of indignities equal injustices, compounded. Key concerns: Landlords need to recognize their comparative financial privilege. Screening out tenants with poor credit or past criminal history perpetuates homelessness. Testimony highlights: “I don’t take this investment lightly. This was a huge financial decision for my family. It’s something that we hope will help to pay for our kids’ college someday, if that’s what they choose. “At the same time, I think it is important that we recognize that anyone that’s in the position of owning a rental property benefits from serious financial privilege, at a time when many in our community are facing serious financial challenges, even when they’re working full time. 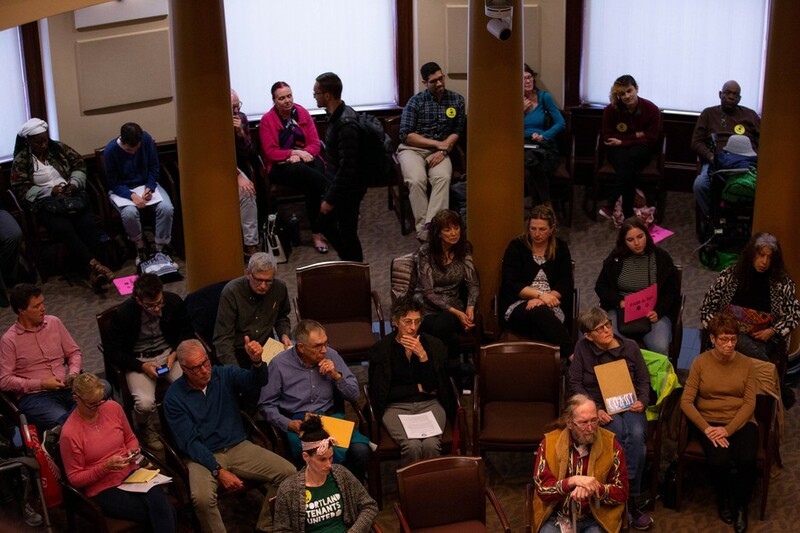 Proponents of the housing ordinance proposed by the Portland City Council hold up a sign in support during testimony on April 4, 2019. “I’ll be really clear, these proposed screening rules are absolutely not a burden. They actually align with how responsible landlords and property managers should be treating applicants anyway. I have no problem with the non discrimination requirements regarding an applicant’s criminal history. My take is that just because someone committed a crime in the past does not mark them as a horrible tenant for the rest of their life. “People wonder why so many people in our community are experiencing homelessness and one of the major reasons is that people who have any kind of criminal activity in their past cannot find a place to work or live.